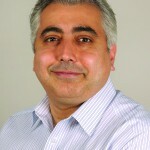 Firas Al-Niaimi reviews the evidence surrounding the mechanisms of action, applications, and future use of topical formulations of vitamin C…. Firas Al-Niaimi reviews the evidence surrounding the mechanisms of action, applications, and future use of topical formulations of vitamin C.
Vitamin C is the most abundant antioxidant in human skin1. The importance of vitamin C for our health was signified in 1937 by Dr Albert von Szent-Györgyi who won the Nobel prize for discovering vitamin C deficiency as the main cause of scurvy2. Unlike plants and some animals, humans are unable to synthesize vitamin C due to the absence of an enzyme called L-glucono-gamma lactone oxidase. Therefore, we rely entirely on oral supplementation either in the form of tablets or diet (citrus fruit and green leafy vegetables), and topical application in the case of cosmeceuticals for the skin3. With increasing evidence of the protective effects of vitamin C and its derivatives on the skin, vitamin C has become a popular cosmeceutical agent. Biochemically, vitamin C has a 5-hydrocarbon ring similar to that of fructose4. When ingested in usual doses of up to 100 mg per day, complete absorption of vitamin C occurs in the distal small intestine. The plasma half-life is reported to be between 8–40 days. With higher levels of intake, more rapid renal excretion occurs and the half-life is thought to decrease markedly to about 30 minutes5. Absorption of oral vitamin C is limited by active transport mechanism and despite high doses of oral supplementation, only a small fraction of it will eventually be biologically available and active in the skin. Hence, for any discernible role of its actions in the skin, vitamin C needs to be supplied topically2. Vitamin C is available in a number of active forms. Among all the available options, L-ascorbic acid is the most biologically active and well-studied3. L-ascorbic acid is a hydrophilic and unstable molecule, hence the poor penetration into the skin due to the hydrophobic character of the stratum corneum. L-ascorbic acid is also a charged molecule, which further limits its penetration6. The instability of the molecule (it degrades upon exposure to air and light) means that for L-ascorbic acid to be able to remain stable and penetrate through the stratum corneum, it needs to be formulated in a way that provides both stability and permeability. An effective method of achieving this is by reducing the acidity of L-ascorbic acid to below pH 3.5, which has shown to greatly aid in its penetration, largely due to the transformation from the charged to the uncharged form of the molecule6. In one example of the currently available L-ascorbic acid product (Skinceuticals by L’Oreal), the addition of ferulic acid aids in both the stabilisation of the molecule as well as achieving an acidity of a pH below 3.5 7. Saturation of tissue is achieved after three daily applications of L-ascorbic acid, and the half-life in tissue is about four days6. Two other common topical formulations of vitamin C include ascorbyl-6-palmitate and magnesium ascorbyl phosphate (MAP). Unlike L-ascorbic acid, which is hydrophilic and unstable, both ascorbyl-6-palmitate and MAP are lipophilic, esterified forms of vitamin C, which are stable at neutral pH8. Ascorbyl palmitate is hydrolysed to form ascorbic acid and palmitic acid8. Ascorbyl palmitate is thought to have an antioxidant and anti-inflammatory effect. However, studies on the efficacy of ascorbyl palmitate have shown conflicting results. While there is some evidence to suggest that ascorbyl palmitate can reduce UV-induced erythema9, improve inflammation10, and inhibit tumour production11 others suggest that it may be toxic to keratinocytes in the presence of UVB. The mechanism for this is unclear but it is thought that when ascorbyl palmitate is oxidised, it generates ascorbyl free radicals that may cause damage to cell membranes12. Magnesium ascorbyl phosphate appears to be the most stable and preferred ascorbyl ester. Due to its lipophilic nature, it is easily absorbed into the skin. 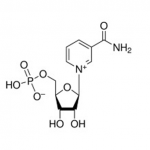 MAP is dephosphorylated when it crosses the epidermis, and is converted to ascorbic acid8. In laboratory studies, MAP has been shown to scavenge free radicals and increase collagen production13–16. In clinical studies, a 10% MAP cream demonstrated significant improvement in melasma and senile freckles17. Examples of other stable esterified derivatives of vitamin C are disodium isostearyl 2-0 L-ascorbyl phosphate, ascorbic acid sulphate, and tetraisopalmitoyl ascorbic acid18. 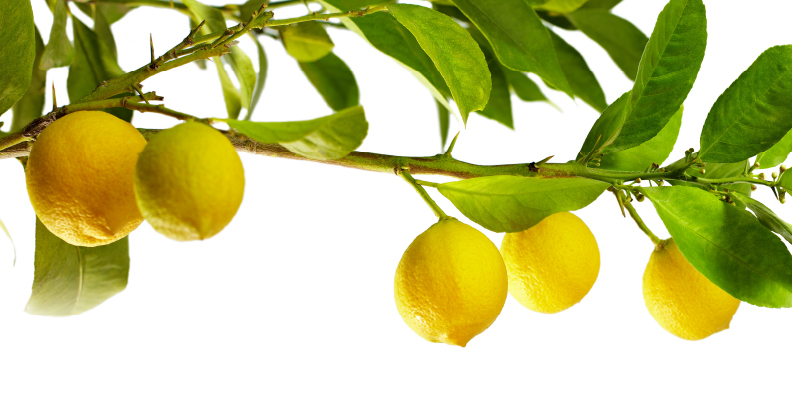 Although esterified forms of vitamin C are a potential way to stabilise the molecules and improve penetration through the stratum corneum, one study showed that daily application of MAP, ascorbyl-6-palmitate and other ascorbic acid derivatives did not increase the levels of L-ascorbic acid in the skin6. above 20% does not increase its biological significance and in contrary may cause some irritation6. The most available reputable products of vitamin C today are therefore in the range of 10–20% to exert an antioxidant effect and with lower concentrations for its role in anti-inflammatory conditions. Intrinsically aged skin has been shown to have 70% less concentration of various antioxidants including L-ascorbic acid compared to young skin19. In addition to this, environmental factors such as solar radiation, pollution, and smoking can accelerate damage to the skin through the generation of so-called ‘oxidative stress’20. Although the skin has its inherent antioxidant defence mechanism to cope with oxidative stress, chronic, and excessive exposure can overwhelm the antioxidant capacity, and lead to photoaging, immunosuppression, and photocarcinogenesis21. Trans-urocanic acid is a by-product of filaggrin present in the skin, which acts as a chromophore for photons of solar radiation (mainly ultraviolet (UV) and to a degree, infrared) leading to the formation of singlet oxygen. This triggers a cascade of events leading to the formation of so-called ‘reactive oxygen species’ or ‘free radicals’22. These are highly toxic unstable molecules that can cause damage to nucleic acids, proteins, and cell membranes. Antioxidants such as vitamin C act by neutralizing the singlet oxygen cascade and therefore limiting the formation of reactive oxygen species. This occurs predominantly by a process of electron transfer and/or donation3,23. UV-induced reactive oxygen species induce erythema and pigmentation, and can lead to alteration of the collagen and elastin components in the skin. This gives rise to the appearance of sunburn and clinical manifestations of photoaging such as pigmentation, telangiectasias, coarse texture, deep wrinkles and solar elastosis. UV-reactive oxygen species triggers the signal transduction cascade, which leads to upregulation of activation protein-1 (AP-1) and nuclear factor-B (NF-kB), and downregulation of transforming growth factor-β. These proteases collectively upregulate matrix metalloproteinases (MMPs), which degrade collagen, reduce collagen production, and increase elastin accumulation24. Sunscreens are only partially effective in blocking free radicals produced by UV exposure. Vitamin C exerts a photoprotective effect against photoaging by preventing UV-induced erythema and pigmentation, sunburn cell formation, and induces collagen repair. Vitamin C has been shown to inhibit the activation of AP-1, which leads to a reduction in MMP production and collagen damage24. In laboratory studies, vitamin C deficient mice have been shown to have significant UVB-induced pigmentation25. Fibroblasts stimulated with ascorbic acid in cell culture have also been shown to increase gene expression of collagen and produce more collagen26. Beneficial effects of vitamin C on elastin have also been observed. Elastin is an enzyme that degrades elastic fibres leading to the characteristic appearance of photoaging known as solar elastosis. In vitro studies have shown that vitamin C inhibits the biosynthesis of elastin27. Although UV irradiation depletes vitamin C transporters in the epidermis, transporters found in the dermis where collagen production takes place are unaffected28. Therefore, increasing the level of vitamin C in the skin may hypothetically reduce the damaging effects caused by UV radiation. In animal studies, it was found that application of 5% ascorbic acid two hours prior to UV exposure reduced skin wrinkling29. The photoprotective effects of vitamin C are also seen in human clinical studies. One double-blind placebo-controlled study on 10 subjects using 10% topical vitamin C over a 12-week period showed a statistically significant reduction in photoaged scores and improvement in wrinkling in vitamin C treated patients, compared to placebo30. A significant improvement in furrows on skin histology and clinical appearance was seen in another double-blind, placebo-controlled study using 5% topical vitamin C on 20 subjects over a 6-month period31. However, the effect of oral supplementation of vitamin C remains controversial32, owing to the reduced bioavailability of the vitamin at sufficiently high concentrations in the skin. CD1a-expressing Langerhans cells are antigen-presenting cells present in the epidermis, which act by initiating a protective immune response. Their numbers are decreased upon acute and chronic UV exposure33. Vitamin C containing topical solutions have been shown to prevent the reduction of CD1a-expressing Langerhans cells upon UV radiation34. UV-induced erythema and thymine dimer mutations contribute to photocarcinogenesis. In addition, UV-induced reactive oxygen species induce mutations on the p53 gene, which affects the repair of damaged DNA and induces a process of programmed cell death (apoptosis)35. In laboratory studies, application of 10% topical vitamin C has been shown to reduce UVB-induced erythema by 52% and apoptotic sunburn cell formation by 40–60%36. 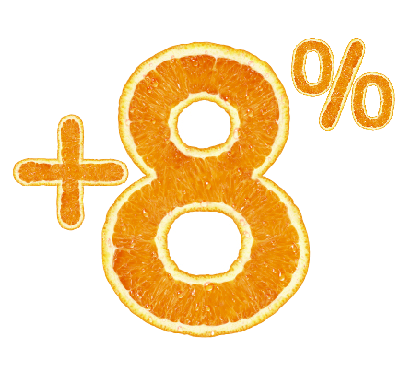 In clinical studies, vitamin C containing solutions have been shown to be particularly effective at reducing UV-induced thymine dimers, thereby potentially reducing the risk of photocarcinogenesis37. Although the exact mechanisms of intrinsic ageing are not clear, both intrinsic and photo-aged skin are associated with MMP-mediated collagen breakdown leading to thinning of dermal papillae and flattening of the epidermal-dermal junction. In intrinsically aged skin, there is an increase in AP-1, MMP-1, and MMP-9 levels. Consistent with this, there is also a four-fold increase in partially degraded collagen in aged skin compared to young skin. Vitamin C is essential for collagen biosynthesis and is thought to have an anti-ageing effect. More importantly, it serves as a co-factor for prolyl and lysyl hydroxylase, key enzymes that cross-link and stabilise collagen fibres38. Vitamin C also directly activates the transcription factors involved in collagen synthesis and stabilises pro-collagen mRNA that regulates Type I and III collagen synthesis. In addition, vitamin C increases the gene expression of collagen and synthesis of the tissue inhibitor of metalloproteinase-1 (TIMP-1), which decreases collagen degradation24. The anti-ageing effects of vitamin C have been demonstrated in a clinical study showing that daily application of topical vitamin C was shown to increase the density of dermal papillae in aged human skin39. Aside from its anti-ageing and photoprotective effects, vitamin C is also known to be the primary replenisher of vitamin E. Vitamin E is a liphophilic antioxidant and has a primary role in protecting cell membranes against oxidative stress and maintaining the collagen network in the skin. Similar to vitamin C, its levels are rapidly depleted after UV exposure24. Due to the role of vitamin C maintaining active vitamin E stores, there are an increasing number of products containing a combination of vitamin C and E on the market. Studies have shown that the addition of vitamin E increases the protection 4-fold40. Such photoprotection was augmented and doubled to 8-fold when ferulic acid was added to the mixture of vitamins C and E41. An anti-inflammatory effect of vitamin C has also been observed both clinically and in cultured human cells. Laboratory studies have shown that vitamin C inhibits activation of transcription factor NFκB, a transcription factor responsible for the production of a number of pro-inflammatory cytokines such as TNF-alpha, IL-6 and IL-8. These cytokines are responsible for a number of inflammatory pathways implicated in a wide range of inflammatory dermatoses. Studies have shown that vitamin C can promote wound healing and prevent post-inflammatory hyperpigmentation3. However, the evidence remains limited and vitamin C is not widely used in practice for inflammatory dermatoses. Vitamin C also plays a role as an anti-pigmentation agent. It interacts with copper ions at tyrosinase-active sites and inhibits the action of the enzyme tyrosinase — the main enzyme responsible for the conversion of tyrosine into melanin — and thereby decreasing melanin formation42,43. A clinical study examining the effect of a topical formulation containing 5% vitamin C and a chemical penetration enhancer reported a significant decrease in pigmentation caused by melasma after 16 weeks44. Although vitamin C has been shown to suppress melanin production, its clinical effects may not be as effective as other topical products containing hydroquinone45. Vitamin C is generally well-tolerated and has a good safety profile. The combination of vitamin C with other topical anti-ageing agents has been used without any reports of significant adverse reactions. Minor adverse reactions such as skin irritation and oxidative changes of vitamin C causing yellow staining of the skin and clothes, and hypopigmented hair can occur18. Rarely, contact dermatitis has been reported46–48. Clinical studies on the efficacy of different formulations of topical vitamin C in human skin remain limited. The challenge lies with developing a stable formulation and finding the most efficient transepidermal delivery method for the esterified forms of vitamin C (e.g. ascorbyl palmitate, MAP etc.) in order to maximise the concentration of active vitamin C in the skin. 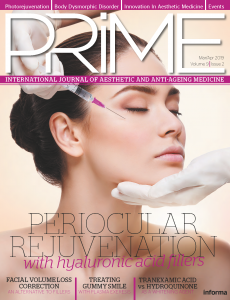 Recent studies have shown that methods such as nanoparticles, multi-layered microemulsions for graded delivery, ultrasound, iontophoresis, laser resurfacing, and microdermabrasion can help to enhance penetration of vitamin C18,49,50. However, these studies remain small and there are no comparative studies to determine the optimal delivery method. Also, further larger studies are needed to confirm the synergistic effect of vitamin C with other antioxidants and growth factors. Methods to deliver huge doses of vitamin C via oral and intravenous means have been explored, however, their effectiveness on the skin remains controversial5,32, again due to the reduced bioavailability of the vitamin at sufficiently high concentrations in the skin. Continuous efforts are being made to research into other benefits of vitamin C and these include the effects of vitamin C on hair growth, wound healing, smoking-related skin ageing, scars, and striae51–55. Vitamin C is one the most powerful antioxidants in the skin. Due to its antioxidant, neocollagenesis and skin lightening properties, its clinical applications range from photoprotection, anti-ageing, and anti-pigmentation. With an excellent safety profile, it has become a popular cosmeceutical agent. However, clinical studies on the efficacy of vitamin C remain limited and the challenge lies in finding the most stable and permeable formulation in achieving the optimal results. Meves A, Stock SN, Beyerle A, Pittelkow MR, Peus D. Vitamin C derivative ascorbyl palmitate promotes ultraviolet-B-induced lipid peroxidation and cytotoxicity in keratinocytes. J Invest Dermatol. 2002 Nov;119(5):1103-8. Tyrrell RM. Solar ultraviolet A radiation: an oxidizing skin carcinogen that activates heme oxygenase-1. Antioxid Redox Signal. 2004;6(5):835-40. Godic A, Poljšak B, Adamic M, Dahmane R. The role of antioxidants in skin cancer prevention and treatment. Oxid Med Cell Longev. 2014;2014:860479. Traikovich SS. Use of Topical Ascorbic acid and its effects on Photo damaged skin topography. Arch Otorhinol Head Neck Surg 1999;125:1091-8. Chen L, Hu JY, Wang SQ. 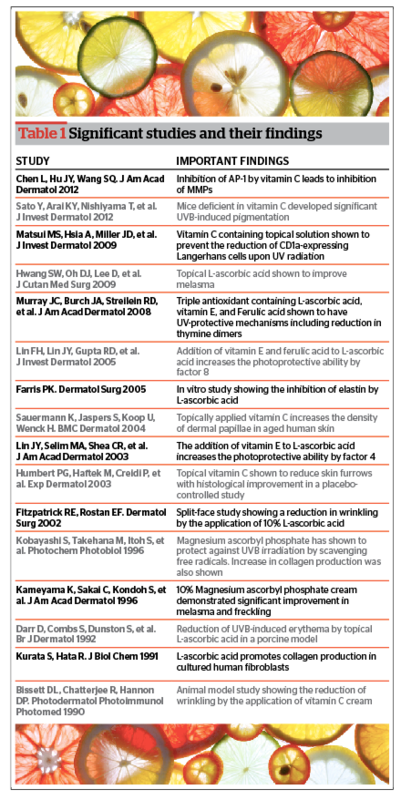 The role of antioxidants in photoprotection: a critical review. J Am Acad Dermatol. 2012 Nov;67(5):1013-24. Sato Y, Arai KY, Nishiyama T, et al. Ascorbic acid deficiency leads to epidermal atrophy and UVB-induced skin pigmentation inSMP30/GNL knockout hairless mice. J Invest Dermatol. 2012 Aug;132(8):2112-5. doi: 10.1038/jid.2012.105. Epub 2012 Apr 12. McArdle F, Rhodes LE, Parslew R, Jack CI, Friedmann PS, Jackson MJ. UVR-induced oxidative stress in human skin in vivo: effects of oral vitamin C supplementation. Free Radic Biol Med. 2002 Nov 15;33(10):1355-62.